One of the Northwest Territories’ most famous ‘bush’ pilots was Wilfrid Reid “Wop” May. Born on April 20th, 1896 in Carberry, Manitoba, raised and educated in Edmonton, he acquired his unusual nickname early in life when his cousin tried to say Wilfrid; it came out ‘Woppie’ and the shortened form ‘Wop’ stuck. In 1916 May joined the Army and as a machine gun instructor went overseas with the 202nd City of Edmonton Battalion. There he applied for a transfer to the Royal Flying Corps and after receiving instruction as a pilot joined the 209th Squadron. May’s 13 German aircraft ‘kills’ and his close encounter with German ace Baron Manfred von Richthofen, the “Red Baron”, made him famous. Back in Edmonton after the war May formed his own small aviation company entertaining crowds at country rodeos as a barnstormer. This dangerous and poorly paid profession didn’t work out so he joined Imperial Oil Limited in November of 1920 and was instrumental in their use of airplanes in the early development of the Norman Wells oil field. After leaving Imperial Oil May spent a few years with the National Cash Register Company in Dayton, Ohio but was back in Edmonton by 1926 and back into the aviation field as an inaugural member of the Edmonton Flying Club and their chief flying instructor. In December of 1928 May flew the first medical emergency flight when he piloted an open cockpit airplane, under severe winter conditions, from Edmonton to Fort Vermilion to deliver medicine. He is credited with saving the lives of many of the residents of that northern Alberta community. News of this mercy flight was carried round the world by radio and May became famous and put this new found fame to use by once again forming a business which he called Commercial Airways, a company that was awarded the first contract to deliver air mail to remote northern Alberta and Northwest Territories communities. May flew the first mail delivery flight into the Northwest Territories December 10th, 1929. This was the longest airmail route in the world covering every community along the Athabasca, Slave and Mackenzie rivers from Fort McMurray to Aklavik (map), a distance of more than 2600 kilometres . Commercial Airways bought Canadian Airways and May stayed on as a pilot and once again became the focus of a news hungry public when he flew a Canadian Airways Bellanca during the 1931 search for the Mad Trapper of Rat River. From the late 1930s through to the early 1950s May held executive positions with Canadian Airways and with Canadian Pacific Air Lines. On June 21st, 1952, at the age of 57, he died of a heart attack while hiking in Utah. In 1974 Wilfrid Reid “Wop” May was inducted into the Canadian Aviation Hall of Fame in recognition of “his aeronautical brilliance in the cruelest geographical arenas” and for promoting the role of the airplane in the development of Canada’s north. 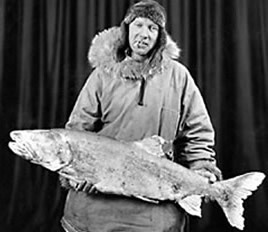 Wop with Lake Trout from Great Bear Lake N.W.T.